I was familiar with the fantastic books of Marcia Williams when I discovered Lizzy Bennet's Diary and honestly would not have even opened this book if it had been written by almost anyone else. Curious about the origins of Lizzy Bennet's Diary, which is somewhat different from Williams's other books (see below) I turned immediately to the "Dear Reader" pages at the end of the book. 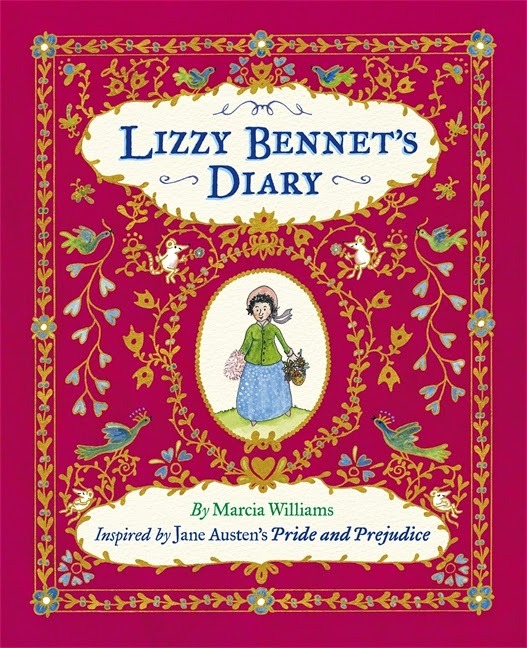 There Williams shares that she was inspired to create Lizzy Bennet's Diary "after reading Jane Austen's novel Pride and Prejudice for about the tenth time!" 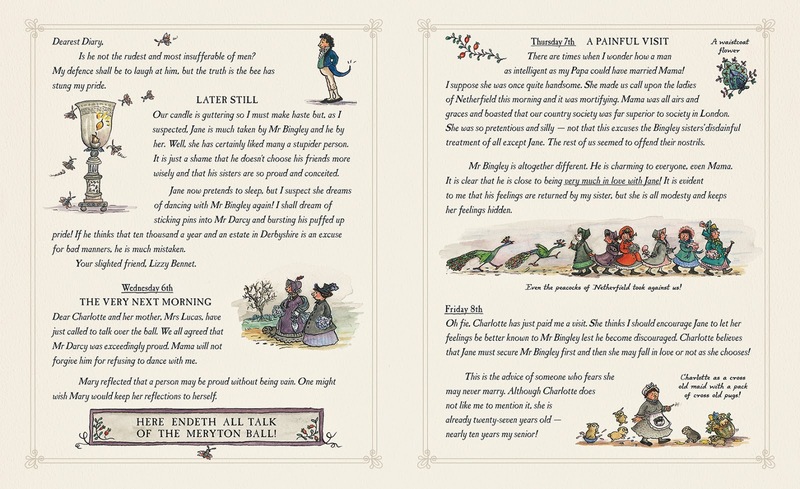 Knowing that creating this scrapbook diary was personal passion for Williams and that the quality in content and illustration and playfulness that she brings to her adaptations of other famous works as well as her original inspirations decided it for me. While I am still not entirely sure of the young audience for Lizzy Bennet's Diary, I do think that this is a book worth calling attention to. Twenty-something years ago when I was pregnant with my first child, I began reading and rereading the works of Jane Austen (and even toyed with the idea of naming my daughter Jane Austen.) A few years after that, the wave of movie and mini-series adaptations of Austen's works began rolling out, followed by the literary continuations, adaptations, updates and occasional desecrations of Austen's novels and characters. With enough distance between past readings (and viewings) I recently began listening to the audio versions of Austen's works and had just finished Pride and Prejudice when I picked up Lizzy Bennet's Diary, feeling prepared to read closely and critically, if needed. While Williams stays true to Austen's story, her Lizzy as narrator has a girlish voice that is appropriate for young readers, especially when she is expressing the delights she finds in nature as well as literature and the tiresome aspects of some of the rituals of the day. Despite this, the theme of marriage remains central to the story. 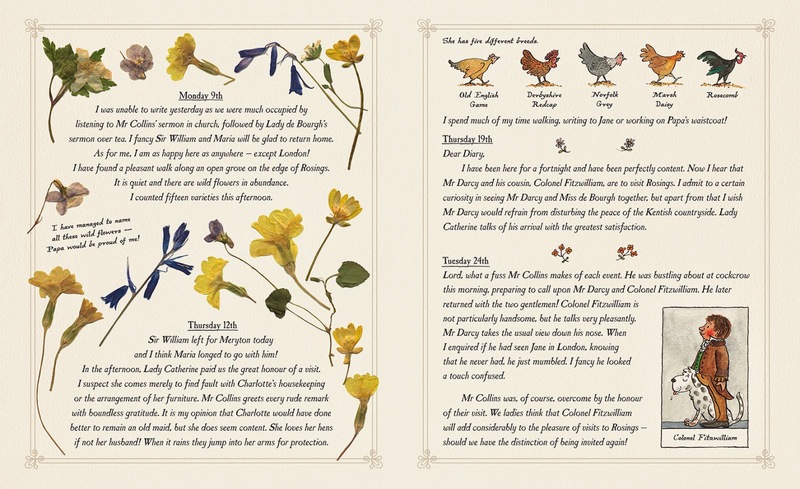 While the fates of Jane and Mr. Bingley, Charlotte and Mr. Collins, Lydia and Wickham and of course, Mr. Darcy drive the story, Williams includes details that enhance the diary format of the book and give a rich feel for the historical time period. Lizzy includes sketches and paintings of a "rain-drenched Song Thrush outside my window," a self-portrait and a portrait of Jane, as well as examples of the button-hole embroidery designs that she is adding to her Papa's waistcoat. There are also fabric samples, pressed flowers and leaves, locks of hair and ribbons that are represented by photographs. 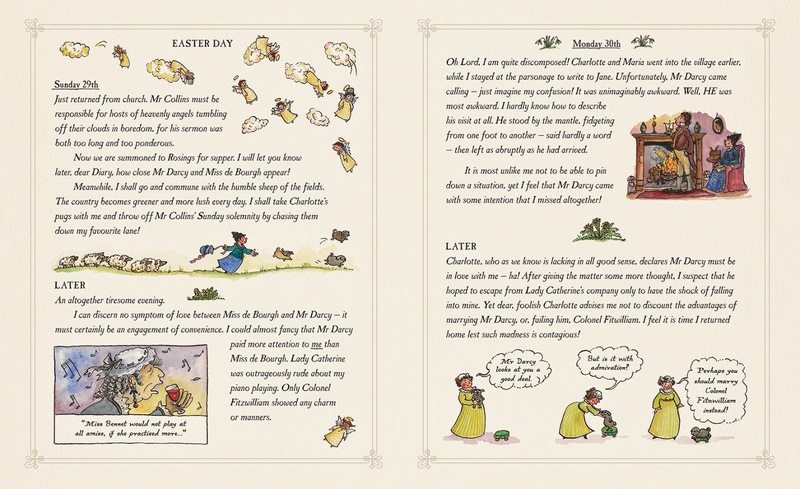 Add to this the many letters and invitations that fold out from the pages of the diary and, adult or child, Austen fan or not, you will find yourself engrossed in Lizzy Bennet's Diary for hours. Upon my recent revisiting of Pride and Prejudice, I was struck by aspects of Elizabeth Bennet's character and observations that I had forgotten or overlooked on previous readings and am impressed that Williams incorporates them into her version of Lizzy's diary. Her comments on the vast differences between her father and mother's personalities, the lack of sense and propriety in Lydia appear, as is expected, in this diary form and are tempered by Williams's lively sketches in the margins of the diary pages of cats chasing mice, dogs chewing shoes, birds on wing and pigs and sheep on the run, in addition to borders of leaves, flowers, hearts and tea cups. If all this is not enough to convince you, despite everything I knew about Marcia Williams when I opened Lizzy Bennet's Diary, it took the enthusiastic embracing of the book by two adult Jane Austen aficionados (ages 70 and 84) to convince me that this is indeed a book worth sharing with you here.